Norah Jones big hit broken down so you can learn it step-by-step, note-by-note, till you sound like ya wrote it yourself. 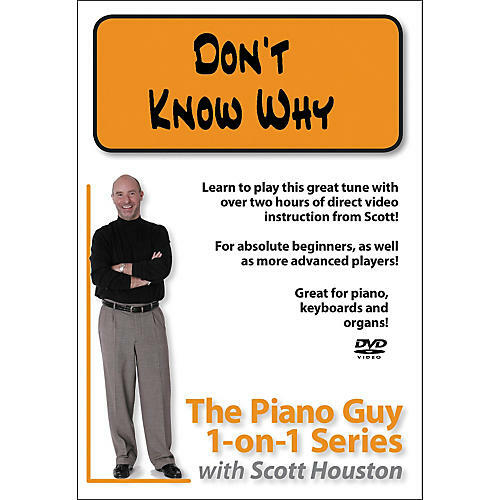 The Piano Guy 1-On-1 Series - Don't Know Why DVD is part of a terrific instructional series designed to do one thing extremely well - teach you to play great songs, in this case the 1999 Norah Jones hit. It includes approx. 2-1/2 hours of direct video instruction, plus lead sheets. Starting from an absolute beginner's point of view, and continuing all the way through what a professional might play while working a gig, you will learn to play this song along with instructor Scott Houston. It's like taking a few private lessons from The Piano Guy himself! Working step by step, chapter by chapter, Scott teaches you what you need to know about the tune to be able to proudly sit down and play it like a pro. Watch his hands on the piano while following the highlighted measures on the lead sheet to really gain an understanding of what's being taught at all times. The DVD also includes play-along audio tracks and song composer info and a discography. One DVD. One coach. One amazing way to master a one amazing song. Order today!